Affordable housing projects have more complex legal and financial structures than traditional developments. There are many misconceptions about nonprofit, affordable housing developers and the homes that we produce. From the myth that we are overly reliant on public funds to the false belief that our buildings are costly and unattractive, developers of income-restricted homes face a never-ending battle of dispelling misconceptions and stereotypes. To set the record straight, we’ve identified 10 key points you should understand about mission-driven housing development. 1. Public funding generates private funding. The cornerstone to most affordable housing development is securing city, county, state and federal resources. But that’s not where funding ends. Public dollars are leveraged to secure private financing, such as traditional bank debt and Low-Income Housing Tax Credits. For every dollar of public funding received, we generate approximately two or more dollars from private funding. Nonprofit developers constantly look for smarter, better ways to build. That’s how we stretch public financing to build as many homes as possible. 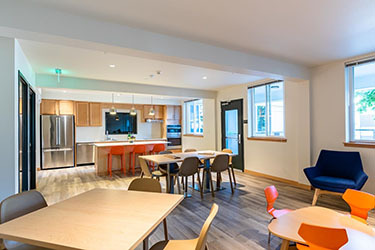 Bellwether Housing’s recent innovations include dramatically increasing building scale, using green building techniques to reduce operating costs, and designing building layouts that reduce construction costs. 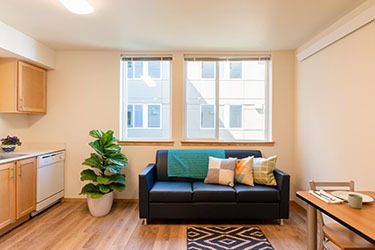 Arbora Court opened in April with 40 furnished homes serving University District families exiting homelessness. Arbora Court residents use this gathering space for celebrations, after-school tutoring and community events.